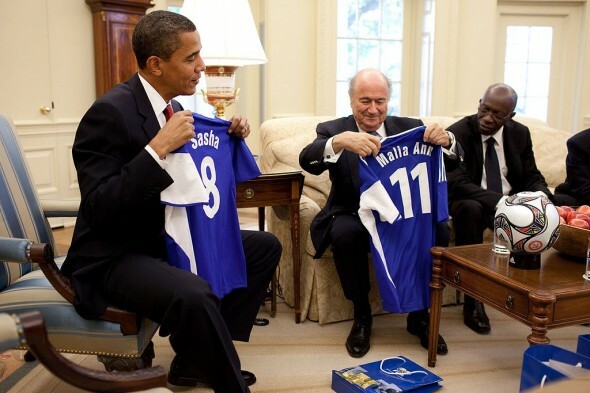 The 2010 selections of Russia and Qatar as host nations, ahead of the U.S. and England, brought FIFA’s long-known tradition of corruption to American law and politics. There’s a great scene late in the movie Continental Divide where John Belushi, playing a Chicago newspaper columnist named Ernie Souchak, has a moment of clarity in his effort to bring down a corrupt Chicago politician. He figures out that the politico murdered one of his sources and, fortified by bourbon, Souchak confronts him at a restaurant. The movie races to a conclusion as Souchak gets the goods on Councilman Yablonowitz (gloriously referred to in headlines in the movie as “Flabby Yabby”) and brings him down. Real life doesn’t move as fast as Hollywood, so the comeuppance delivered to FIFA president Sepp Blatter, who announced his resignation Tuesday evening in Switzerland in the wake of a massive scandal that led to more than a dozen arrests, took a little time. But you could theorize that it did have a starting point, a moment of clarity when it should have dawned on everyone that his days were numbered. On Dec. 2, 2010, soccer fans awaited announcement of the awarding of the 2018 and 2022 World Cup soccer tournaments. The announcement of the host country of the World Cup is always a huge deal, but this one was different. It would be televised live worldwide. With interest in the sport growing at an historic rate, it would be the first time that many American fans paid attention to the story, their interest partly fueled by the belief that the 2022 tournament would be awarded to the USA. Sports bars filled with fans awaiting word. In Seattle, the Sounders hosted a bash at F.X. McRory’s in Pioneer Square. By 6:45 a.m. the legendary bar was full, most people sipping coffee to accompany their croissants but some opting for the good stuff despite the fact that the sun was still an hour away from peeking over the Cascades. The mood was anticipatory and festive — unless you happened to speak with one of the Sounders executives. He quietly admitted that by all indications not only was the USA going to be shut out of the 2022 bid but that England was also going to be passed over for the 2018 tournament. The overt corruption of vote buying and kickbacks inherent to the way FIFA does business was so pervasive that even the front office of a club in MLS, thousands of miles away from the meetings, heard and believed the election had long ago been bought. Those fears were realized a few minutes later after a long, rambling introduction that didn’t exactly make sense (a cynic might think Blatter was killing time until he got the thumbs-up that all the money had landed in the right bank accounts), Blatter announced the 2018 World Cup was going to Russia and the 2022 event was awarded to Qatar. The appearance of possible malfeasance in the process was obvious to all. How did Qatar, a tiny Middle Eastern nation with practically no stadiums and where average summertime temperatures routinely eclipsed 105 degrees, convince soccer’s governing body that it was the best place for the showcase tournament? The answer, clearly, was money from mysterious sources. While that was not a new phenomenon in FIFA’s business dealings, there was something different that Blatter and his cronies either mistakenly overlooked or arrogantly ignored: A higher level of scrutiny. People in the U.S. were paying attention and they cared. By 2010, soccer’s popularity in America was no longer an isolated or odd thing. The sport had been fully embraced by many fans and media. Games from around the globe were beamed into bars and homes on a daily basis. This led to a lot more fans, media members, and federal investigators wondering what in the hell they had just witnessed on that December morning. The whole thing had the feel of something that perhaps FIFA might have pulled off in its past. But now ESPN and FOX had regular soccer shows where talking heads debated what had taken place. Within a few days a stories emerged linking Qatar’s bid to a global youth soccer program that the country had apparently been bankrolling since 2005. By early 2011, U.S. law enforcement agencies began their investigation that led to the arrests last month in Zurich and ultimately led to Blatter’s announcement Tuesday. It’s an interesting coincidence that the rise of soccer’s popularity in America directly led to Blatter’s demise. For years, international soccer fans have openly derided the USA for being so far behind (both in knowledge and on-field play) the rest of the world when it comes to futbol. Let’s be honest, it’s fun for many people to watch the almighty Yanks struggle to even be respectable at the top level of the sport. But we’ve come a long way since the day in 1988 when FIFA awarded the 1994 World Cup to America. One of FIFA’s conditions for the cup to be staged here was that the USA would develop a top-level professional league. Maybe that was going to happen anyway, but it’s a fact that MLS exists today because FIFA ordered it to happen, and the birth and success of MLS has had a major impact on the sport’s growth and popularity. As soccer’s popularity increased here, so did the interest of businesses and media to be involved. While we may still lag behind others in passion and knowledge for soccer, we’re at the adult table when it comes to business dealings and media power. So by the time December 2010 came around, there was a much higher level of American business engagement with soccer, making it far less likely that FIFA could get away with business as usual. When they engaged in the open and obvious corruption for the 2018 and 2022 selections, it was only a matter of time until the wolves would be at the door. They arrived ready to proesecute with a pile of evidence so mountainous that in the end Blatter went from cockily defiant to quitter in less than a week. Maybe this story will be nothing more than a blip. Maybe the other big shoe in this mess (moving the 2022 World Cup out of Qatar) will never drop. But for now the entire thing serves as an interesting reminder that the increased interest in soccer in America was accompanied by a powerful media and financial beast, which should have led FIFA to be mindful of how they conducted business. That it didn’t shows that the arrogance and corruption in the organization runs so deep that it may never be completely eliminated. I have no problem with Sepp Blatter’s ouster, although he was hardly the only corrupt FIFA official with skins in the game. On the other hand, I’m trying to wrap my mind around how the U.S. government has jurisdiction in all of this. I applaud the charges but don’t understand how FIFA is accountable to Loretta Lynch and the DOJ. The alleged criminals used American bank accounts, and some of the alleged deals were made on American soil. Under American law, that’s good enough for A.G. Lynch to go, well, “Beast Mode” on FIFA. If they used non-US banks for the wire transfers, the DOJ is powerless. BTW, I enjoyed “Continental Divide”. It showed Belushi could carry a movie as a leading man and not just a clown prince. Shame he didn’t live long enough to make more. Thanks for the explanation. I’m just happy to see the DOJ do something I agree with…that it’s FIFA in the crosshairs makes it that much better. All wires in the US go thru the Fed as well, making this a Federal issue. Great history of the FIFA mess. Let’s hope Blatter’s resignation triggers a turnaround. Nice column by the Gas-man, who for a long time was the only KJR host who acknowledged the existence of ‘futbol’. That’s OK. They barely acknowledge the NHL, too. Blatter going thru the election process and winning over Prince Ali (I keep hearing Robin Williams singing the Abwabwa song from Aladin when I say his name) for the FIFA presidency and then announcing his resigning just smacks of David Stern retiring during his tenure instead of finishing it. Both then get to either name or at least heavily influence who their successor is and with the NBA Adam Silver has been very good at continuing Sterno’s legacy. I can’t help but wonder if the same will happen in FIFA with Batter’s heir apparent. Since Blatter’s No. 2 just got targeted by the DOJ, he won’t be a candidate. The names I’ve seen aren’t in the Blatter camp. Wait and see. BTW, Robin Williams was the only one I saw who could cut Blatter down to size before this. YouTube the draw for the 1994 USA World Cup. Blatter was the emcee, Williams was a celebrity picked to select balls from the pot, and he let loose such a barrage of one-liners, Blatter couldn’t keep up.